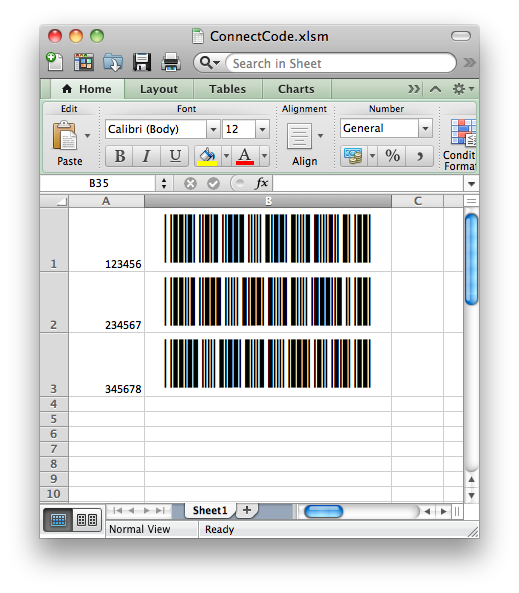 ConnectCode Barcode Software includes Open Type barcode fonts that can be used in Microsoft Office for Mac 2011/2016 for creating barcodes. Functionality available in the software encoder e.g. creating check digits, generating start/stop characters, validating inputs and generating barcode output characters are provided as Microsoft Office formulas (Excel/Word formulas). These formulas are developed in Visual Basic for Applications and are available for downloaded on this web page. They can be used under the terms and conditions of ConnectCode Barcode Software. Please note that you will need a registered copy of ConnectCode Barcode Software (available on the Mac App Store) to use these formulas. The Office VBA formulas can be imported into Excel to create industry-compliant barcodes within minutes. The steps are illustrated below. Ensure that you have downloaded the officebarcodeformulas.zip (for OS X) file or macOSoffice2011barcodeformulas.zip (for macOS) file above. Uncompress the zip file to locate the Excel formulas (MSOfficeBarcodeFormulas.bas file). 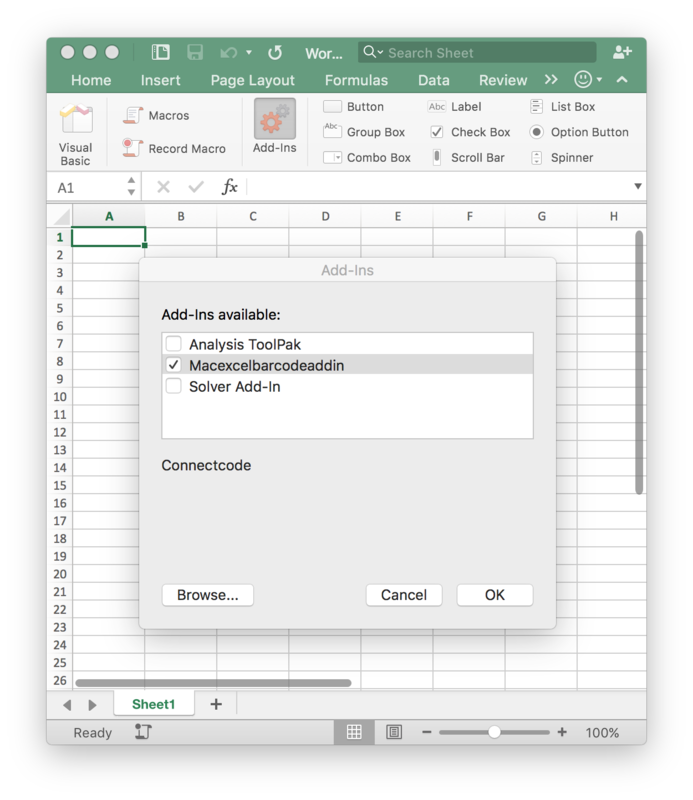 Launch Microsoft Excel, create a new Workbook and select the Developer tab. Click on the Editor button to launch the VBA editor. Navigate the Import File dialog to choose the MSOfficeBarcodeFormulas.bas file. You will be able to see the formulas imported as Module1 in the Project window as shown below. 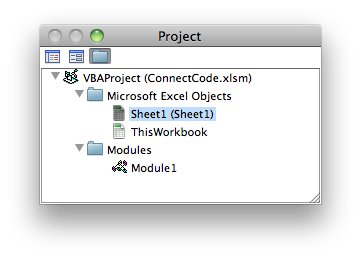 Click on Excel > Close and Return to Microsoft Excel (or Command Q) to close the VBA editor and return to Excel. You have successfully imported the formulas to Microsoft Excel. Ensure that you have downloaded the officebarcodeaddin.zip file. Uncompress the zip file to locate the Excel Add In (MacExcelBarcodeAddIn.xlam file). Launch Microsoft Excel, create a new Workbook and select the Developer tab. 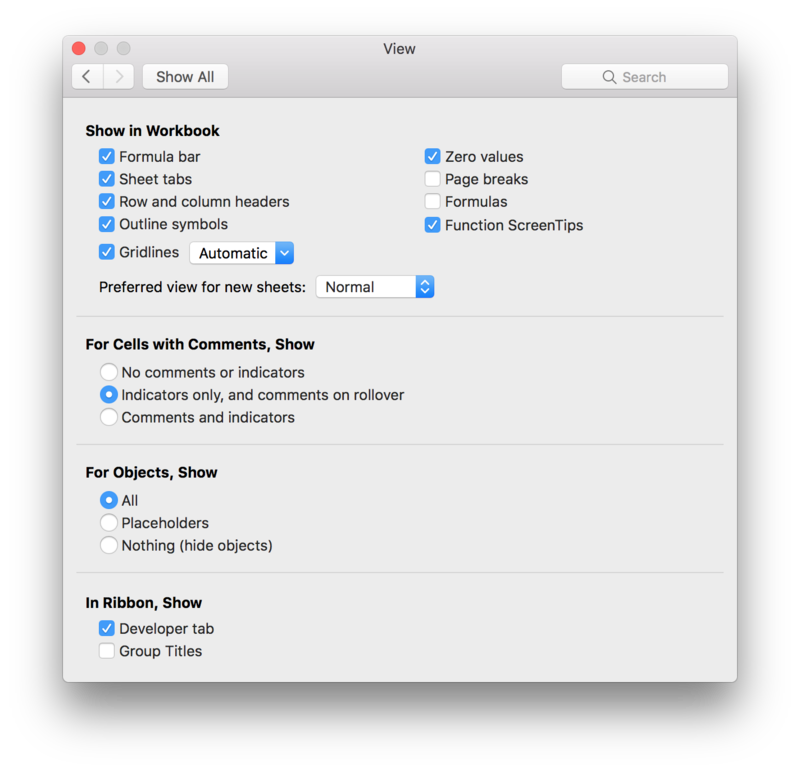 If you do not see the Developer tab, you can go to System Preferences > View to enable it. Please see the options highlighted in red below. In the Developer tab, click on the Add-Ins button. Next, click on the Browse button and select the MacExcelBarcodeAddIn.xlam file. Click on the OK button to return to Excel. You have successfully imported the formulas to Microsoft Excel by adding the Add In. Enter the value "123456" into cell A1 of the spreadsheet as shown below. Enter the formula "=Encode_Code39(A1)" into cell B1 of the spreadsheet and press then enter/return key. The complete list of formulas can be found in the PDF documentation of the downloaded zip file. Notice the value "*123456L*" generated in cell B1. The formula validates the input in cell A1, adds the start/stop characters "*", and generates the check character "L". Select cell B1 and click on the Home tab. In the ribbon Font group, select "CCode39_S3" as the font and "24" as the font size. 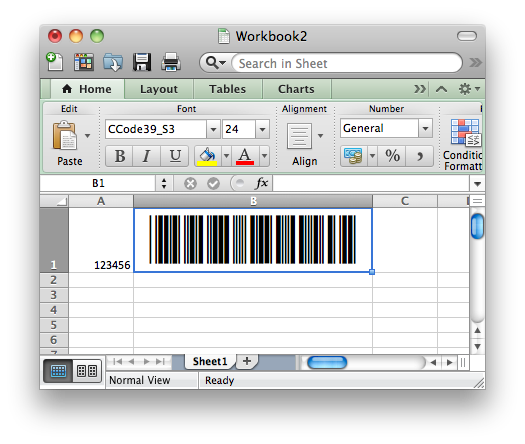 Note : You will need to install a registered copy of ConnectCode Barcode Software and setup the barcode fonts on your Mac before you can use the "CCode39_S3" font in Microsoft Excel.